Info Who's in that car? Turn it this way. Welcome Wagon is one of Mona's microgames in WarioWare: Twisted! 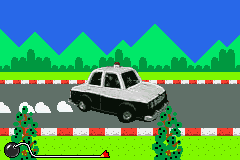 The player controls a moving car. The game's purpose is to make this car stop and face the screen. If the car faces the screen, the game is won; however, if the car is turned to the wrong way or if time expires and it is still not turned, the game is lost. It doesn't matter when or how long the player has to keep the car facing that way, or even if they stop facing it toward the screen for a moment before turning it back. As long as the car is facing toward the screen by the very last millisecond of the microgame, the player wins. 1st level difficulty: The car rolls on a Mario Circuit-like road. 2nd level difficulty: The car rolls on a desert. There is less flexibility to be turned too much to the left. 3rd level difficulty: The car rolls on ice. There is very little flexibility to be turned too much to the left. This page was last edited on November 17, 2018, at 03:31.